Ⅰ.Manual Mode,the Standby Can Adjust the Time but Speed Not,and Default Time Is 10 Minutes,Max 20 Minutes;When Operating,Speed Adjustable,Levels From 01 to 99,But Time Not. Ⅱ.Auto Mode,LED Shows P1,P2,P3, P4.These Modes Will Run at A Certain Rhythm.Time and Speed Cannot Be Adjusted,Exersise Time Is 10 Minutes. In P4,the Machine Vibration Levels Switch Back and Forth Between 30 and 70. 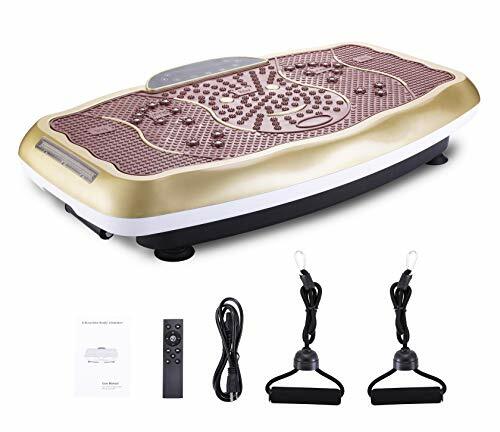 Whole body relax and training machine--Relax your muscle, stimulate blood circulation ,lose weight, burn fat, tone muscles with just one machine. Easy to use -- Auto mode and manual mode is available,the vibration speed can be adjusted from 1 to 99 levels to meet different intensity training. Enjoy music while exercising--This machine supports Bluetooth & USB connect, you can listen to music from all Bluetooth compatible devices such as phone, MP3 Player or laptop. Multi-function LCD screen-- You can operate the machine by touching the screen,also you can use the remote control to operate the machine. The screen can show vibration time and speed. Stable to use and easy to move--Four non-slip suckers on the bottom ensure the stability of the machine while using, a wheel on left side makes it easy to move even for women.